It’s been a while between posts due to a crazy summer, part of which you are going to read about below, and this isn’t going to be your normal Collision of Church & State post. I debated about posting this since it really has nothing to do with politics or religion, but this is my blog, and I’ve made the decision to post it anyway. My beautiful Grandma passed away from cancer on the 20th of this month, and while I could think of a million words to describe her, I don’t feel like I can do her character – or her story – justice. So, while she was nearing the end I tried a different approach. My Grandpa has been silenced by a debilitating illness, and all of the words he would have wanted to say right now are held captive in his mind. He saw her, but he couldn’t hold her. He heard her, but he couldn’t say the words he wanted to say to give her comfort. Growing up, I enjoyed my alone time with both of my Grandparents, but my Grandpa would often take the time we had together to talk about my Grandma. He would tell me stories, and more importantly, he told me how much my Grandma meant to him, and why he loved her so much. I think it was his way of reminding me that a love so unimaginable like theirs was still possible in a very fallen world. When my Grandma was nearing the end I wrote a letter to her from my Grandpa, my own words are not sufficient, and his mouth is silenced, so I used my memory to try to piece together my words, his words, and his heart to create the letter I believe he would write if only he could. Yesterday, or what seems like yesterday, we said “I do.” My life was forever changed in ways I could have never imagined. The years went by too fast, and the moments accumulated. We have more laughter in a week than most people see in a year. I married a beautiful, stubborn, opinionated woman. We made the impossible work. In a trailer that wasn’t big enough to move in we started a family, and we didn’t give up. I was your protector, your confidante, and often, the one that got on your last nerve. We started a business and made it flourish, and sometimes things were stressful, but we didn’t give up. We raised our children, and watched as the nest emptied. We held our newborn Grandchildren and watched as they grew, you spoiling them every time you had the chance. We retired and moved around, and knew that as long as we were together, everything would be fine. There was nothing more beautiful to me than seeing you pregnant, and one of my favorite stories to tell is of you stumbling in the middle of the night to get to the bathroom with a baby on the way. We had moments of embarrassment, and I always knew that I could make you blush. I loved the way that you loved our kids, the way that together we both knew that we would do anything for them. I loved the way you dented our bank account to spoil our Grandkids. I love that it doesn’t take a mansion to make you happy, and that the joy you have when you give is more beautiful than a farm in Kentucky. We never had the rich lifestyle, but that didn’t matter. I gave you all of me, and you gave me all of yourself, this made us more blessed than the rest of the world. My heart broke with yours, and yours with mine. You know all of my secrets, and I am the owner of yours. I was proud to have you on my arm, and often thought that those who saw the beautiful woman I had won were jealous. They had to be, it wasn’t possible to see you and not be jealous of me. You are my greatest accomplishment, but more than that, you are my home. Over the years, we perfected the slammed door and the cold shoulder. There were days when we both wanted to flee, but what kept us there was so much stronger than anything our arguments consisted of. There was never a moment when the heart on the other side of the slammed door did not belong to you… You must know that. I had my evenings on the couch, we had apologies, and you got to remind me of why I had to apologize for many years to follow. We can laugh about that, because it is just another part of you that I love. Even on my angriest of days, you are still the face I want to see when I wake up in the morning. Your hand is always the hand that I want in mine. Plus, you can really cook. You and I always had something to talk about, we wanted to share our days with each other, and I was genuinely excited to hear you speak. Most of the time at least. I even enjoyed your backhanded slaps after I said comments like that. The angry looks you give me are meant to chastise me, but I hate to break the news to you, I love them with all of my being. After all of these years together, we still laid in bed just talking or laughing before going to sleep almost every night. I loved to make people laugh, but you must know that your laughter was the greatest achievement my words could ever have. People say that I am a good man, but some don’t realize that so much of who I am I owe to you. You made me want to be your hero, even if that just meant making you smile when your world was falling apart. I couldn’t fix all of your pain, but I was determined to see you through it. And I was humbled when you did the same for me. The world can’t begin to know your selflessness and kindness, and they can’t possibly know how bright my world became when you stepped into the room. If all of the world was only half as kind as you are, it we be a much better place. You have loved me as no one else in this world is capable of loving me. You never gave up on me, even when my body was betraying us both. You never stopped making me feel like your man, even when your man could no longer feed himself. You never made me feel like a burden, even when taking care of me took all of the strength you had. I watched you when you weren’t looking, and even in our old age, you are still the most beautiful woman I have ever seen. You put up with me every time I said “nice jaws” as you walked away. By the way, just because I can’t say it, doesn’t mean I’m not thinking it. Now, my love, I must tell you, I’m sorry that I can’t be there like I want to be with my entire heart. My arms won’t let me hold you as I want to, they won’t let me carry you as my heart demands they should. My mouth won’t let me say the words that I know you need to hear, but you were always good at reading my mind anyway, so I know that you know exactly what is in my heart. You and me, what a story, what a history, what a life. You are a part of every moment that made this life worth living. Every song about love I sang to you, and Shirl, I never stopped singing to you, it’s just that my body no longer lets it out. You are the strongest woman I’ve ever known, and I am beyond proud to call you my wife. I promise that I’m here, even though it feels like I’m far away. While I haven’t been able to sleep by your side, my heart has never left its owner, it has never left my bride, and it never will. I owe a great debt to the keeper of the stars. I am so incredibly proud of the love my Grandparents had for one another, and a bit of their story deserved to be shared. My Grandma fought her cancer with dignity, and my family came together for her through this entire process. We miss her, but I think you can see a part of her in all of us, even the part of her that gave a handkerchief to a man picking his nose in the car next to her. “If you get there before I do, don’t give up on me. 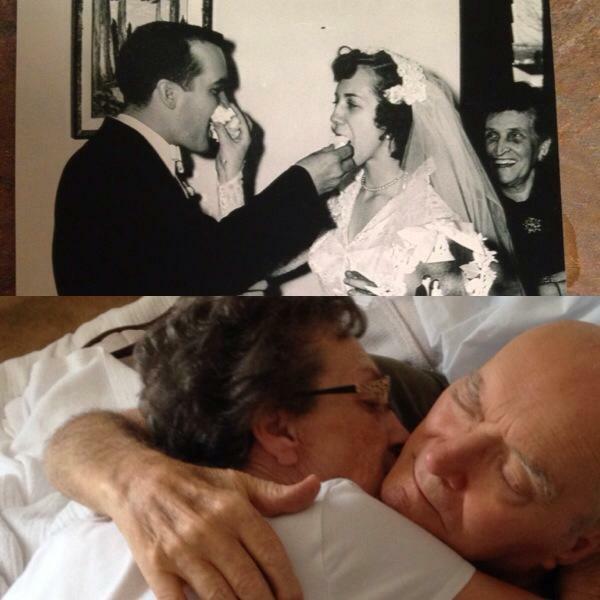 So much love… My Grandparents Had that too! I know you wrote that for THEM, but reading it made me feel the Love … the Love they Had for each other,and the love they HAD for their children and Grandchildren…all the work, all the Hard times…PA, and Mamaw…I could NOT have writtten it Better!